True to the Italian tradition of preparing vegetables and fruits by the simplest means in order to preserve their natural flavor, FROM AND ITALIAN GARDEN includes more than two hundred delicious vegetable and fruit recipes, each of which is versatile enough to be served as an appetizer or a main course. Starting with antipasti, the recipes range from the light but savory Sautéed Mushrooms with Garlic and Parsley to zesty Leeks with a Green Caper Sauce. The creamy Fennel and Broccoli Soup is just one of many soups that can be served either hot in the winter or cool, topped with Parmesan and olive oil, in the summer. The Tuscan tradition of serving bread at every meal is brought to life with spreads like Eggplant Caviar and Sun-Dried Tomatoes, and uncommon variations on traditional themes like Pizza with Roasted Onions, Rosemary, and Taleggio Cheese. Since the days of the ancient Romans, pasta has been an integral part of Italian life. In FROM AN ITALIAN GARDEN you’ll find the secrets of mixing, rolling, and cutting fresh pastas and how to prepare delicious dishes like Green Ravioli with Basil and Goat Cheese Filling, and Baked Ziti with Fontina Cheese and Three Squashes. 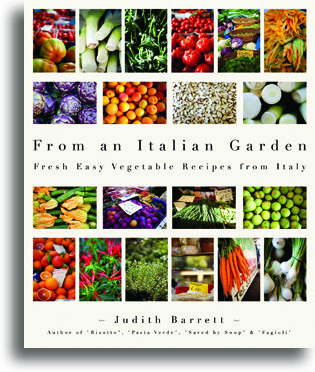 Recipes for grains and beans, two other mainstays of Italian cooking, range from delicate and subtle to hearty, including the rich-tasting Risotto with Artichokes and Lemon, crispy Fried Polenta with Mushrooms, the dumpling-like Potato Gnocchi with Gorgonzola and Cream, or the robust White Beans with Escarole and Garlic. There are savory pies and omelettes, torte and frittate, served with an assortment of vegetables, all baked with Parmesan and fresh herbs. The salads are just as varied, from the classic Sicilian Salad of Sliced Red Onion and Oranges to Potato and String Bean Salad. For dessert, there’s a warm, wintertime Baked Apples Stuffed with Raisins and Pine Nuts or a cool, berry-lover’s treat of Strawberries, Raspberries, and Blackberries with Raspberry Sauce and Mascarpone. All of the recipes are by prefaced with a short explanation about the ingredients. You’ll learn about olive oil in its various grades, stocks, cheeses, vinegars, and most of all about the vegetables and fruits that are essential to Italian cuisine. There will be historical notes as well as personal stories from the author, Judith Barrett. FROM AN ITALIAN GARDEN draws on the richness of Italian culture and tradition for a selection of recipes that is equally varied and tempting, and best of all, healthful.